The power market is an important tool for ensuring cost-efficient use of electricity resources. The Norwegian Energy Act is based on the principle that electricity production and trading should be market-based, while grid operations are strictly regulated. The power market ensures that effective use of resources and reasonable prices on electricity. Electricity transmission and distribution is a natural monopoly, and not subject to competition. An important principle in the regulation of the power supply system is the distinction between monopoly operations and operations that are well suited to competition. Electricity is different from other goods in that it cannot easily be stored. There must therefore always be an exact balance between generation and consumption. In the wholesale market, prices are determined for each separate hour of the following 24-hour period, based on bids and offers from many different participants, and given the availability of grid capacity. This short-term market adjustment ensures that the lowest-cost production resources are used first. Electricity prices also provide investment signals because they indicate where there may be a power supply deficit. Norway introduced market-based power trading as long ago as 1991. Instead of planning a gradual transition to market-based solutions, as many European countries have done, Norway organised the changeover so that in principle, the market was open to all customers from the very beginning. Norway was the first country to provide universal market access. The power exchange Statnett Marked AS (now Nord Pool AS) became an important element of the market. Even before this, fluctuating hydropower production in different parts of the country created a need for market-based solutions and electricity trading. 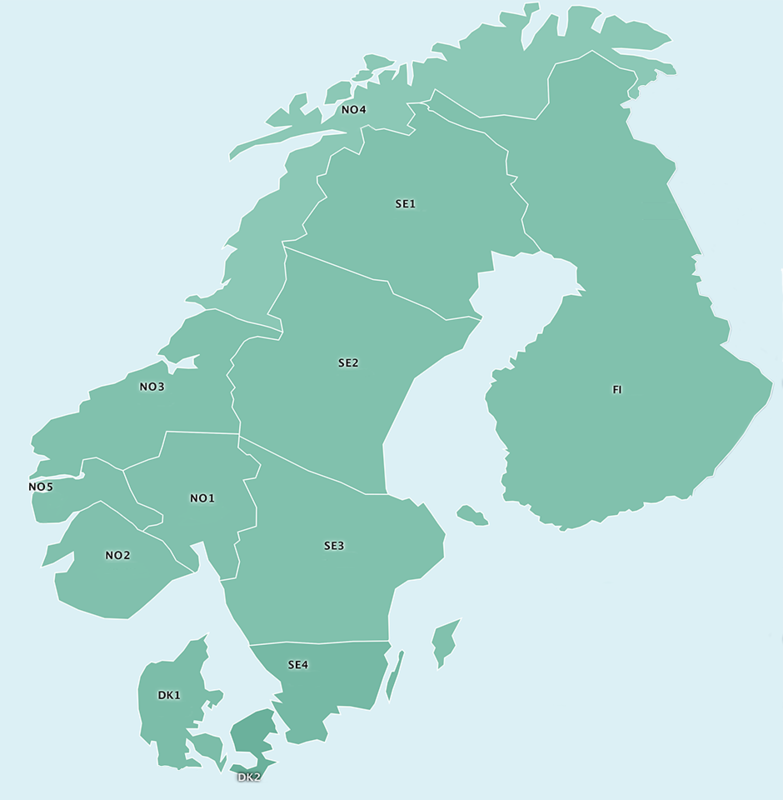 In 1971, Norwegian producers established a power exchange for spot power (known as Samkjøringen). Samkjøringen was formalised as early as 1931, and was a result of many years of cooperation and power exchange between power plants. Today, the Nordic countries are closely linked, both by physical interconnectors, and by financial market integration. Nord Pool, based outside of Oslo, is the exchange for physical power trade for the Nordic and Baltic countries. Nord Pool grew into the world’s first international power exchange from 1996 onwards, as Sweden, Denmark and Finland joined. The Nordic market is also integrated, in both physical and financial terms, with power markets in the rest of Europe. Financial power trading in Europe takes place on the Nasdaq exchange in Stockholm. Market participants use Nasdaq for price hedging and to trade in long-term products and derivatives. Norway is part of a joint Nordic power market with Sweden, Denmark and Finland, and this is in turn integrated into the wider European power market through interconnectors to the Netherlands, Germany, the Baltic states, Poland and Russia. Two new interconnectors with Germany and the UK are scheduled for completion in 2020 and 2021. The EU is taking steps to improve integration of the internal energy market and coupling of the European markets. Market coupling in Europe has previously been on the basis of voluntary cooperation and regional initiatives. The Nordic power exchange, Nord Pool, was established at an early stage. Today, 24 countries are interlinked by European market coupling, which now covers about 90 % of European electricity consumption. Market coupling functions through implicit auctioning, which involves simultaneous calculation of prices and electricity flows between areas in the day-ahead market. Market participants on opposite sides of national borders can make bids and offers hour by hour for the next 24 hours, and do not need to reserve grid capacity in advance. A common European intraday market is under establishment. The first go-live of the Cross-Border Intraday Market project (XBID) was delivered in June 2018 and included Norway and 13 other countries. A second go-live with further countries is foreseen in 2019. More closely integrated physical electricity markets require greater harmonisation of technical rules, trading systems and market design. The EU’s third energy market package was adopted in 2009, and consists of five legal acts that reinforce and continue the development of the internal markets for electricity and natural gas. These replaced the legal acts contained in the second energy market package. The main elements of the third energy market package are concerned with unbundling (reducing vertical integration), strengthening independent regulation of energy markets and developing cross-border infrastructure and security of electricity supply. In November 2016, the European Commission put forward a new package called ‘Clean energy for all Europeans’, which includes proposals amending the third energy market package, together with a new regulation. It is expected that all legal acts under the "Clean Energy for all Europeans"-package will be adopted in the EU before the summer of 2019. Electricity network codes and guidelines that the EU has adopted. Power supplied to the grid follows the laws of physics and flows down the path of least resistance. It is not possible to separate different power deliveries from each other. A consumer who switches on the power has no way of knowing who produced the electricity or how far it has been transported through the grid. The grid companies keep account of how much power each producer delivers and how much each end user consumes, and this forms the basis for settlement. Producers are paid for the volume of power they deliver, and end users pay for their consumption. The power market can be divided into wholesale and end-user markets. Large volumes are bought and sold in the wholesale market by power producers, brokers, power suppliers, energy companies and large industrial customers. Power suppliers trade on behalf of small and medium-sized end users and small-scale businesses and industry. Day-ahead and intraday trading take place on the Nord Pool exchange. Statnett runs the balancing market, as part of its TSO tasks. Market participants may also enter into bilateral contracts on purchases and sales of specific volumes of electricity at an agreed price and for delivery in an agreed period. In the end-user market, individual consumers enter into agreements to purchase electricity from a power supplier of their choice. Norway's end-user market consists of about one-third household customers, one-third industry and one-third medium-sized consumers such as hotels and chain stores. Since 1997, Statnett has been responsible for settling the imbalances in the Norwegian power market, a process known as balance settlement. This ensures that all supply and consumption of electricity is correctly settled, and maintain balance in the power market. In this context, balance means that a market participant’s actual power generation or consumption must be equal to the volume agreed upon on beforehand. To operate in the wholesale market, participants must have a direct balance agreement with Statnett. Participants must either be responsible for their own balancing or have an agreement with a balance responsible party to settle their imbalances for them. In 2017, a Nordic balance settlement service was launched. The company eSett Oy provides imbalance settlement services for market participants in Finland, Norway and Sweden. One purpose of this system is to reduce barriers to establishment for balance responsible parties and power suppliers wishing to provide services in more than one country. The day-ahead market is the primary market for power trading in the Nordic region, and is where the largest volumes are traded on Nord Pool. It is a market for contracts with delivery of physical power hour-by-hour the next day. Participants make bids and offers to the Nord Pool trading system between 08:00 and 12:00 each day. Before 10:00 each day, the TSOs publish trading capacities for each bidding area. The day-ahead auction closes at 12:00 each day. Prices for each hour of the following day are calculated on the basis of the all the purchase and sell orders received and the transmission capacity available. The Nordic day-ahead market is coupled with the day-ahead markets in much of the rest of Europe through implicit auctioning. This means that market participants bid for energy and transmission capacity at the same time. In addition, a system for price coupling of regions (PCR) now covers the Nordic region and much of the rest of Europe. This solution means that Nord Pool calculates prices in the different regions using a common European algorithm, at the same time every day. The day-ahead market plays a large part in ensuring a balance between supply and demand. However, events after the auction in the day-ahead market, for example changes in weather forecasts, may mean that actual production or consumption by market participants changes from their position in the day-ahead market. In the intraday market, contracts are continuously traded in the period between clearance in the day-ahead market and up to one hour before the hour of operation. This allows market participants to achieve a balance through trading. Nord Pool now has an intraday market that operates in the Nordic region, the Baltic region, Germany and the UK. Although the day-ahead and intraday markets create a balance between production and consumption, there are bound to be events that disturb the balance within a specific hour of operation. Statnett uses the balancing markets to regulate production or consumption up or down depending on what is needed to maintain an instantaneous balance. The system is in balance at a frequency of 50 Hz. In the Nordic region, the balancing markets are divided into primary reserves (FCR), secondary reserves (FRR-A) and tertiary reserves (FRR-M). Primary and secondary reserves are activated automatically in response to changes in frequency, while tertiary reserves are activated manually by the Nordic TSOs. Imbalances are first regulated using the primary reserves. As the Norwegian TSO, Statnett is responsible for ensuring that there are always sufficient primary reserves. Primary reserves are traded in separate hourly and weekly markets. If an imbalance lasts for several minutes, secondary regulation is activated, freeing up the primary resources to deal with new imbalances. The TSO purchases secondary reserves in a separate weekly market, which was opened in 2013. If even more reserves are needed, tertiary regulation is activated. This is often called regulating power. These are manual reserves that can have a response time for activation of up to 15 minutes. Tertiary reserves are purchased in the regulating power market (RK), which is a common balancing market for the Nordic power supply system. The TSO ensures that there is sufficient balancing capacity (i.e. 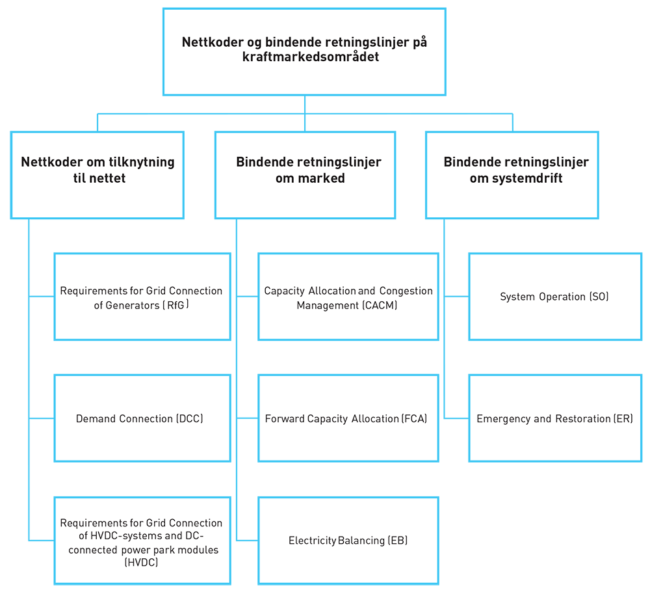 resources for up- and down-regulation) in the Norwegian part of the regulating power market through the tertiary reserves options market (RKOM). Bidders in this market get paid an amount in advance, to guarantee that they will take part in the regulating power market, regardless of whether the resources are actually used. Each day, the Nord Pool power exchange calculates the system price for the following day. The system price is theoretical, and is based on the assumption that there is no congestion in the Nordic transmission grid. The system price is the same for the entire Nordic market, and functions as a reference price for price setting in the financial power market in the Nordic region. Producers submit bids stating how much they are willing to produce at a specified price. The bids reflect the value producers put on their production, closely linked to running costs at power plants. End users submit bids indicating how much they wish to consume at different prices. The price is determined at the level that results in equilibrium between supply and demand in the day-ahead market. In a market equilibrium, the price is determined by the cost of producing the ‘last’ unit of power (the marginal cost). This ensures that the cheapest energy resources are used, so that the demand for electricity is satisfied at the lowest possible cost to society. Norway’s trading capacity with other countries is high, and price levels in Norway are therefore strongly influenced by the cost of producing electricity in thermal power plants, and especially by the prices of coal, natural gas and emission allowances. Renewable production and consumption levels in countries connected to Norway’s power supply system also have an influence. The large proportion of hydropower in the Norwegian and Swedish production mix means that variations in water inflow to storage reservoirs have a strong effect on price variability in the Nordic region. When inflow is high, so is the supply of power, and prices are pushed downwards. In years when precipitation is low and inflow is lower, prices rise. Similar effects arise when there are windy and less windy periods. Market prices are also influenced by temperature fluctuations, since they affect how much energy is needed to heat people’s homes. In addition to the system price, Nord Pool sets area prices, which take into account congestion in the grid. Area prices create a balance between the purchase and sales bids from participants in the different bidding zones in the Nordic region. In recent years, Norway has five bidding zones, Sweden four and Denmark two, while Finland constitutes one bidding zone. I tillegg til systemprisen beregner Nord Pool områdepriser som tar hensyn til flaskehalser i transmisjonsnettet. Områdeprisene er de prisene som skaper balanse mellom kjøps- og salgsbud fra aktørene innenfor de ulike budområdene i Norden. Norge har de seneste årene vært delt inn i fem budområder, Sverige er delt inn i fire områder, Danmark i to områder, mens Finland består av ett. The underlying cause of congestion and different power prices in different areas is that the power situation differs from one region to another, and may also vary on an hourly basis and between seasons and years. Some regions may be experiencing a power surplus when others have a power deficit. Power needs to be imported to areas with a deficit and exported from areas with a surplus. Grid congestion arise if there is insufficient grid capacity to import and export power as needed. When bidding zones are determined, different market areas exist on each side of a bottleneck. This means that the area price is higher in areas with a deficit of power than in those with a surplus. Power flows from low-price areas to high-price areas, thus increasing the power supply where the need is greatest. Furthermore, area prices help the participants determine where it is best to increase or reduce generation and consumption. In areas with a power deficit, generation is increased at the same time as consumption is reduced, which improves access to power and security of supply. In addition to being a vital tool for short-term balancing, area prices indicate where longer-term measures are needed in the power system. They make producers and consumers aware of where new generation capacity or new major consumers should be sited. The division into bidding zones does not mean that there will automatically be different area prices. When there are no capacity constraints in the Nordic power grid, area prices will be the same throughout the Nordic region and will correspond to the system price. Consumers who purchase power for their own consumption, are called end users. End users in Norway are free to choose their power supplier. Small end users normally purchase electricity from a power supplier, while larger end users, such as large industrial companies, often choose to purchase directly in the wholesale market or enter into a bilateral agreement with an electricity producer. Competition in the end-user market ensures that end users can choose between different contracts and find one that suits their needs. Electricity is a homogeneous product; it is not possible to differentiate between different power deliveries. What distinguishes power suppliers from each other is the contracts they offer. Generally, end users can choose between three main types of electricity contracts: fixed-price, standard variable price and spot price (based on market prices, with a mark-up). In a fixed-price contract, the electricity price is fixed for a certain period, for example a year. The supplier is obliged to deliver electricity at this price, regardless of whether market prices go up or down. Thus, a fixed-price contract is a type of financial contract, where the customer is guaranteed a certain price for the period of the contract. A power supplier sets the fixed price on the basis of expectations about electricity prices, with a mark-up to cover costs. The difference between the fixed price and the market price is the risk premium paid for the guaranteed price. In a standard variable price contract, the electricity price varies with developments in the power market. This is also a form of financial contract, but with a short price guarantee period. A supplier is required to inform customers of price changes 14 days before they are put into effect. In a spot-price contract, the price follows the market price determined by Nord Pool. In addition, the customer must pay a mark-up. For households and small businesses, this option is the closest to taking part in the day-ahead market. All Norwegian households are having new electricity meters installed as part of advanced metering systems, also known as AMS. The new meters can measure electricity consumption hour by hour. This means that new types of electricity contracts can be developed based on hourly prices, and end users will be able to adjust their consumption better to prices to minimise their electricity bills. The Norwegian Consumer Council maintains a website, www.strompris.no, where it is possible to compare all the different contracts offered by electricity suppliers. This makes it easy for a consumer to find the most suitable contract. An end user’s total electricity bill consists of charges for several different components of the service: the electricity (power price), connection to and use of the electricity grid (grid tariff), consumption tax on electricity (electricity tax), and value added tax. In addition, there is a fee earmarked for the Energy Fund (Enova), as well as payment for electricity certificates. The power price makes up a varying share of the total end user price, depending on market prices. The electricity tax and the Enova fee are fixed by political decisions, while the price of electricity certificates varies depending on developments in the electricity certificate market. 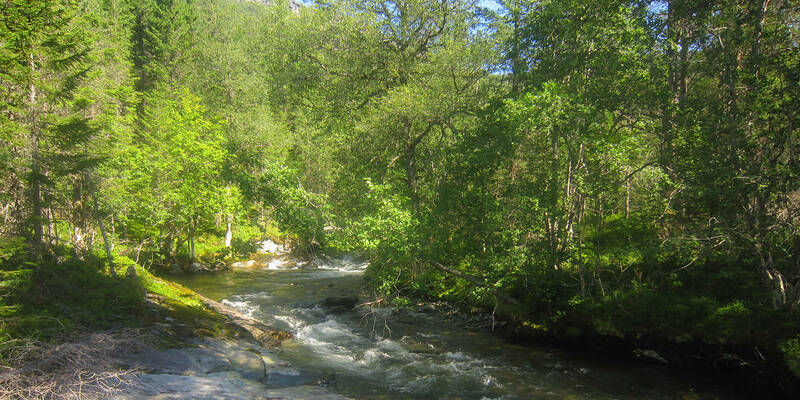 Grid tariffs are fixed by the grid companies, based on a revenue cap and principles for tariffs laid down by the Norwegian Water Resources and Energy Directorate. Grid tariffs are required to reflect the costs of transporting electricity to end users. Financial power trading includes trading with financial instruments used for risk management and speculation. All contracts are settled financially without any physical power deliveries. Financial products are often called long-term contracts because they apply to periods further ahead in time than those for physical products. Financial power trading can take place either bilaterally or on a power exchange. In the Nordic countries, financial trading takes place mainly on the Nasdaq OMX Commodities AS (Nasdaq OMX) exchange. Nasdaq OMX has a license from the Financial Supervisory Authority of Norway, which is also the supervisory authority for the marketplace. At Nasdaq OMX, players can hedge prices for purchase and sale of power for up to six years ahead, split by days, weeks, months, quarters and years. Financial products include future and forward contracts, electricity price area differentials (EPAD) and options. Nasdaq OMX Clearing AB (Nasdaq Clearing) is the clearing house for the financial contracts on Nasdaq OMX. Nasdaq Clearing has a license from the Swedish Financial Supervisory Authority. Clearing activities make an important contribution to operational efficiency in the Nordic power market. Nasdaq Clearing acts as the counterparty in all financial trading on Nasdaq OMX. Bilateral financial agreements can also be cleared. This eliminates the counterparty risk for the participants. Future and forward contracts are agreements on financial settlement of an agreed power volume, for an agreed time period and at an agreed price. For future contracts, settlement can take place during both the trading and the delivery period, whereas for forward contracts, it always takes place when the contract ends. Future and forward contracts are important instruments for price hedging. Electricity price area differentials (EPAD) are forward contracts that cover the difference between the area price and system price. An option involves a right, but not an obligation, to buy or sell a forward contract in the future at an agreed price. NASDAQ OMX only lists European options, which can only be exercised on their expiration, at the end of the contract period. Since 1990, Norwegian cross-border transmission capacity has increased by more than 2000 MW as a result of new interconnectors to Denmark, the Netherlands and Sweden. Norway has been a net electricity exporter in 17 of the past 25 years. Between the mid-1990s and the mid-2000s, there were more years than previously when Norway was a net importer. In the last 10 years, the power balance has improved, and Norway has exported an average of about 8 TWh per year. In 2015, reservoir inflow was high, giving good production conditions. As a result, Norway’s net exports totalled 14.6 TWh in 2015. The share of power imports and exports varies both from year to year and between seasons. Norway’s power trade with both Denmark and Sweden is generally fairly well balanced, and is driven largely by short-term changes in production and consumption. As the importance of wind power in the Nordic production mix has increased, wind conditions have come to play a greater role in determining electricity flows within the Nordic region. When wind speeds are high in Norway’s neighbouring countries, Nordic power prices are reduced. Because of the flexibility of Norwegian hydropower production, Norwegian producers can then retain water in the reservoirs, and a larger proportion of domestic consumption can be met by imports. Conversely, Norway can export power when wind speeds are low and electricity prices are higher. The pattern of exchange between Norway and the Netherlands is rather different. Norway has been a net exporter for ten of the eleven years since the NordNed cable became operative. The Dutch power supply system is largely based on thermal power, and the costs of gas- and coal-fired power production determine prices for much of the year. As long as power prices in the Netherlands are higher than in Norway, electricity will flow towards the Netherlands. If there is a shortage of resources in Norway, prices may rise in Norway, causing the flow of electricity to reverse. In 2018, a total of 20.5 TWh was traded through the interconnectors with Norway. About 40 percent of this was traded with Sweden, 24 percent with Denmark and 36 percent with the Netherlands. The volume of trade with Russia and Finland made up less than 1 percent of the total. Power trading allows countries to derive mutual benefits from differences between the natural resources available, electricity production systems and consumption patterns. Trade between countries results in lower overall costs than if each country were to provide for its energy supplies alone. Power trading is organised with the objective of ensuring that power always flows to where its value is greatest, i.e. from low-price areas to high-price areas. Trade between Norway’s hydropower-based system and thermal power-based systems in continental Europe illustrates this. The Norwegian power system has a relatively flat daily price profile because it does not cost much to regulate production up and down. In thermal power systems, it is costly to regulate production, and there is wider variation in electricity prices during the course of a day. These differences mean that Norway can import electricity from abroad at night, when the price is lower, and export it during the day, when consumption and prices are higher. Over the year, Norwegian electricity exports are normally highest in the summer, when reservoir inflow is high and Norwegian consumption is low. Imports are generally highest in winter when inflow is low, consumption is high and Norwegian electricity prices are high. Power trading thus moderates price rises in Norway in winter, and maintains higher summer prices. In the same way, power trading provides access to relatively low-cost power in dry years, and increases the value of Norwegian electricity in years when there is a surplus of power in the domestic market.